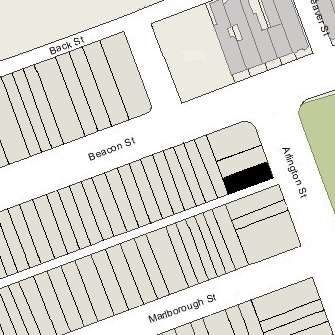 3 Arlington is located on the west side of Arlington, between Beacon and Marlborough, with 2 Arlington to the north and 4-5 Arlington to the south, across Alley 421. 3 Arlington was designed by architects Gridley J. F. Bryant and Arthur Gilman, and built ca. 1860, one of three contiguous houses (1-2-3 Arlington) built for clothing manufacturer and real estate investor John L. Simmons. Click here for an index to the deeds for 3 Arlington. On June 2, 1862, 3 Arlington was purchased from John Simmons by Mary Elizabeth (Crockett) Dana, the wife of Samuel Turner Dana. The Danas previously had lived at 10 Walnut. 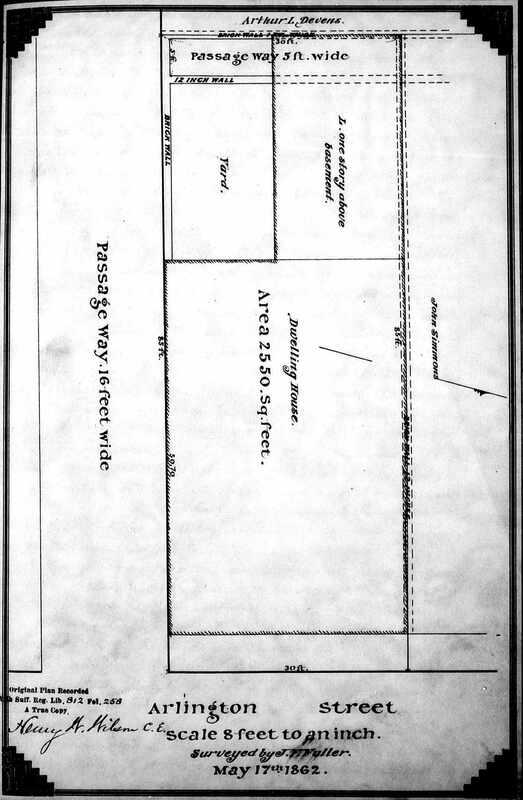 The deed for 3 Arlington was between John Simmons and Mary Dana, the property purchased from her separate estate, but S. T. Dana is shown as the owner on the 1874 Hopkins map. Samuel Dana was a commission merchant dealing in tea and other commodities, and also was agent for George Peabody & Co., London bankers. Samuel Dana died in December of 1877. Mary Dana continued to live at 3 Arlington until her death in July of 1884. During the 1884-1885 and 1885-1886 winter seasons, 3 Arlington was the home of cordage manufacturer Albert W. Nickerson and his wife, Amelia F. (Lindsay) Nickerson. Their primary residence was in Marion. During the 1886-1887 winter season, 3 Arlington was the home of lawyer and former US Circuit Court Judge John Lowell and his wife, Lucy Buckminster (Emerson) Lowell. They previously had lived in Chestnut Hill. By the next season, they had moved to 24 Commonwealth. On June 2, 1887, 3 Arlington was purchased from Mary E. Dana’s estate by real estate dealer Amos Prescott Baker. He and his wife, Ellen Talbot (Smith) Baker, lived there from the 1887-1888 winter season. They previously had lived in Newport. 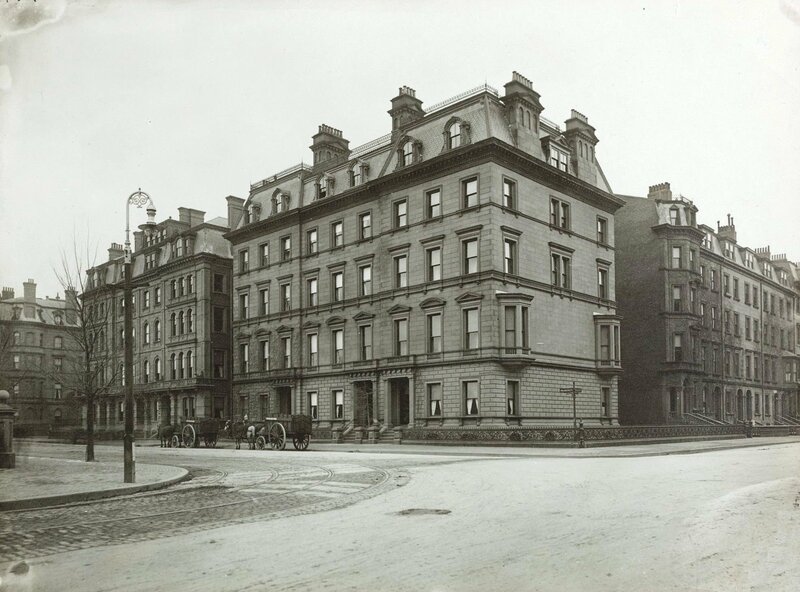 They continued to live at 3 Arlington during the 1897-1898 winter season, but moved thereafter and by the 1899-1900 season were living at the Hotel Victoria at 273 Dartmouth. On November 6, 1897, Miss Annie M. Knight purchased 3 Arlington from A. Prescott Baker. She lived there with her sisters, Margaret Knight and Mary (Knight) Harris, the widow of Jacob Brown Harris. By 1905, she began accepting lodgers and operated a dressmaking, millinery, and child’s outfitting shop in the house. Mary Harris died in March of 1915. Annie Knight and Margaret Knight continued to live at 3 Arlington until their deaths, Annie Knight in 1917 and Margaret Knight in 1919. 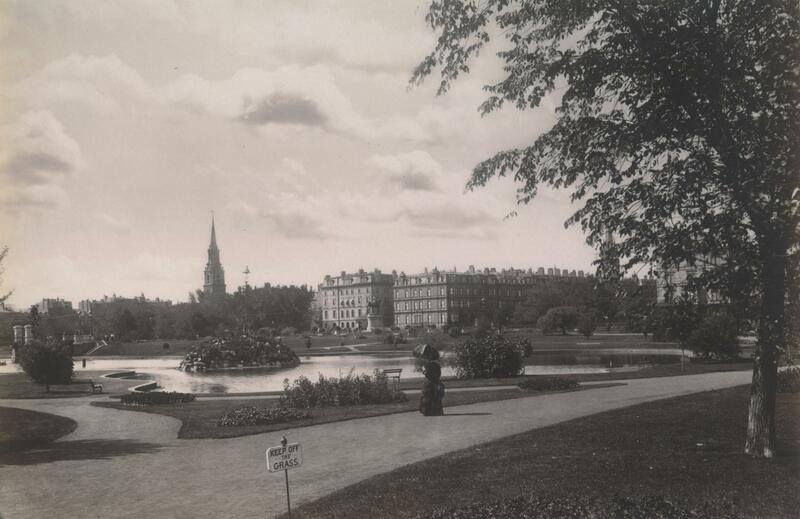 On July 14, 1920, 3 Arlington was purchased from the estate of Annie M. Knight by Lydia Emmet (Eliot) Codman, the wife of stockbroker Alfred Codman. They previously had lived at 51 Hereford. She was the assessed owner of 3 Arlington from 1921 through 1950 and is shown as the owner on the 1928 and 1938 Bromley maps. The Codmans separated in the early 1920s and Lydia Codman operated a dressmaking business at 3 Arlington (she had started a millinery and lingerie business in about 1918, while they were living at 51 Hereford, after her husband’s stock brokerage business failed). They divorced in 1923 and by 1925 he was living on Cottage Avenue in West Roxbury. In 1924, Lydia Codman married again, to insurance broker Oliver Turner. They lived at 3 Arlington and also maintained a home in Bolton, Massachusetts. Oliver Turner died in July of 1937. Lydia Turner continued to live and maintain her dressmaking shop (called Lydia Codman Gowns) at 3 Arlington. In mid-1948, Lydia Turner married again, to mining executive Quincy Adams Shaw, whose first wife, Sarah Williams (Pemberton) Shaw, had died in January of 1945. After their marriage, they lived at his home at 11 Exeter. On April 10, 1950, 3 Arlington was purchased from Lydia Shaw by Donald Allmon, Inc., a real estate brokerage firm. In March of 1950, prior to finalizing the purchase, Donald Allmon filed for (and subsequently received) permission to convert the property into eight apartments and an office. He and his wife, Janet Cary (Waters) Allmon, lived at 3 Arlington and he maintained his real estate office there. They previously had lived in an apartment at 265 Commonwealth. They continued to live at 3 Arlington until about 1954, when they moved to Manchester. He continued to maintain his office at 3 Arlington until about 1955, when he moved it to 10 Arlington. On August 19, 1954, Donald Allmon Inc. transferred 3 Arlington into Donald Allmon’s name. On September 14, 1954, 3 Arlington was acquired from Donald Allmon by Arthur Crew Inman, an author, and his wife, Evelyn (Yates) Inman. They lived at 8 Garrison. Arthur Inman died in December of 1963, a suicide, leaving a 155 volume diary which was published posthumously as The Inman Diary. On August 28, 1956, 3 Arlington was purchased from the Inmans by Carl N. Gleason. In October of 1957, he filed for (and subsequently received) permission to convert the property from two offices and seven apartments to one office and eight apartments (which appears to already have been the approved use). On September 1, 1959, 3 Arlington was acquired from Carl Gleason by Elisha Russell Greenwood and his wife, Charlotte (Baldwin) Greenwood. They lived in one of the apartments. They previously had lived at 97 Chestnut. E. Russell Greenhood changed his name from Greenhood to Greenwood in the early 1960s. A former lawyer, he was president of Lumber Dryolators Inc. By the late 1960s, he was a wool broker, and by the early 1970s he was a real estate manager and developer. In September of 1965, E. Russell Greenwood applied for permission to remove the mansard roof and add a story to the building, increasing the number of apartments from eight to ten. He subsequently abandoned the application. Constance Greenwood died in December of 1974. E. Russell Greenwood continued to live at 3 Arlington until about 1976, when he moved to an apartment at 780 Boylston. On April 30, 1976, 3 Arlington was acquired from E. Russell Greenwood by Robert Emmet Dinsmore. On May 1, 1984, 3 Arlington was purchased from Robert Emmet Dinsmore and Helen A, Dinsmore by Frank Mondano and his wife, Juliane Mondano. 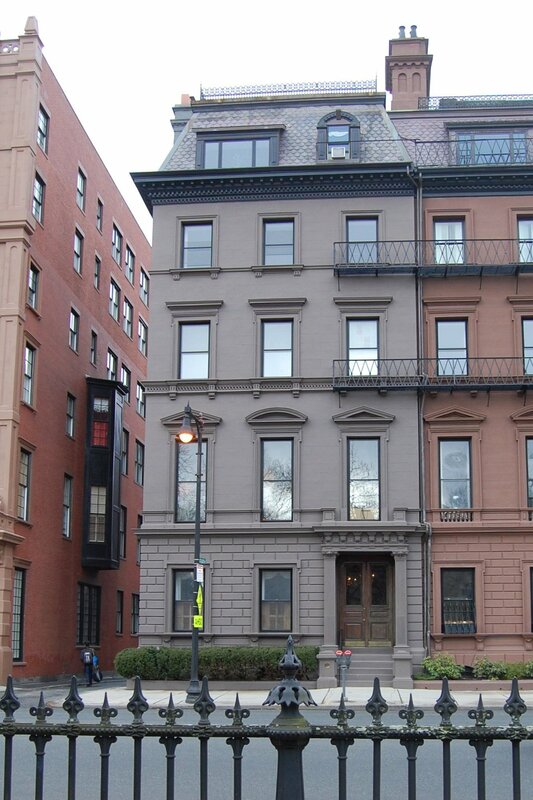 On October 19, 1984, they converted it into one commercial (office) condominium unit and six residential condominium units, the 3 Arlington Street Condominium. On September 26, 2018, the unit owners amended the condominium master deed to change the designation of the commercial unit to residential use.